- Have you taken the core science and math courses more than 12 months ago? - Were your grades on these subjects below A's? If you answered "yes" on either question above, you need deep study of the core science and math, not just a quick review, for the PCAT. We have the solution - re-learn these subjects via our break-through Rapid Learning courses, one subject at a time, 24 hours per subject. 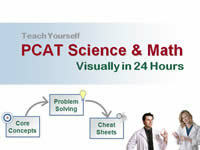 We have EVERY required subject in biology, chemistry and math by PCAT. Rapid Learning offers 10 courses to cover PCAT science and math with one to one match. PCAT Science Platinum Combo - Rapid Learning 24-Hour Series, is the powerful rich-media package to study all five required PCAT subjects (PCAT Subtest #3 and #4), learning in 24 hours per subject. Note: Each platinum course is $199. The 5-course combo is $599 (buy-3-get-2 special). 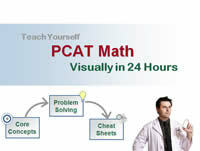 PCAT Math Platinum Combo - Rapid Learning in 24 Hours , provides in-depth coverage on each required math subjects to prepare you powerfully in PCAT Subtest #7 Quantitative Ability, via the rich media way..
PCAT Science and Math (x10) Platinum Ultimate Combo - 10-Course Pack on Biology, Chemistry and Quantitative Ability PCAT Subjects. This is an ultimate combo: PCAT Science Combo + PCAT Math Combo, total of 10 subjects with 10 24-hour Rapid Learning courses - the most powerful preparation on the most important areas of PCAT. Each subject above has 24 chapters, one-chapter-per-one-hour study time, hour by hour in 24 hours. Each Platinum Edition comes with the core tutorial with subject matter voice narration, MP3 Audio and DVD with inclusion problem-solving drills, review cheatsheet, and printable tutorials. Note: Each platinum course is $199. The 10-course ultimate combo is $999 (50% off - the best discount in the entire store). 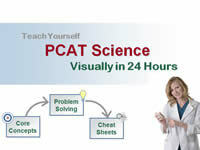 Instant access and get started now with the most powerful, most visual and fastest PCAT preparation. Don't buy anything until you have previewed first. Each of the 10 courses below will offer one free chapter for you to view all components. Note: Be sure to disable your browser pop-up blockers and have Flash Player, Adobe Reader and Media Player installed. Why Rapid Learning's PCAT Courses ? Looking for rapid yet comprehensive in-depth study of PCAT subjects? Solution: These are full 24-chapter college level courses designed for PCAT deep study, by our signature Rapid Learning system, not just an outline or quick review. If you have been away from those core science and math courses for more than 12 months, a high-level review or high-impact overview will not cut it. You need to RE-LEARN the subjects rapidly and visually - that is what Rapid Learning empowers you to achieve. Tired of lengthy test-prep texts and talking-head lectures with no focus? Solution: Forget static test-prep books. The best way to prepare the PCAT is to deep-study all required courses comprehensively topic by topic via a fast-track system such as Rapid Learning. No more monologue teaching. Learn it the rich-media way with enhanced visualization and graphics for both visual and auditory learners. Is this another flash-card system or audio-only review? Answer: No, for deep study of science and math, just flash cards or audio-only review alone will not do the job. Go rich-media! These are visual tutorials developed and narrated by science and math professors, powered by the same technology as YouTube. Furthermore, instead of flash cards, we provide at-a-glance cheat sheets, one per chapter, with 24 cheatsheets for 24 chapters in a course. We also provide a master cheatsheet for the entire course for test-prep super review and memorization keys. As to the audio, we use MP3 only for supplemental learning to visual learning, each MP3 also comes with printable mini-book. How Can I Learn PCAT in 24 Hours? There are total of 24 lessons (topics) in each course, one lesson per hour with 30-minute on concept tutorial, 20-minute on problem drill and 10-minute on cheat sheet. This will make up the 24 hours Rapid Learning on a PCAT subject. To cap it all, you also receive 24x MP3 audio for your iPod or any MP3 player for further review and enhancement learning on-the-go. Optionally, you can also print all the video tutorials out into a set of 24 mini-books for your offline reading. The Rapid Learning PCAT Combo Series – The Easy and Rapid Way to Ace Your PCAT Exam!